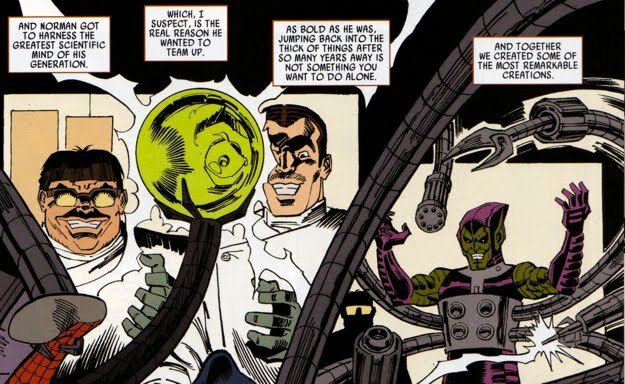 Most fans would agree that the Number 1 & 2 spots on Spider-Man's list of villains are occupied by the original Green Goblin and Dr. Otto Octavius. 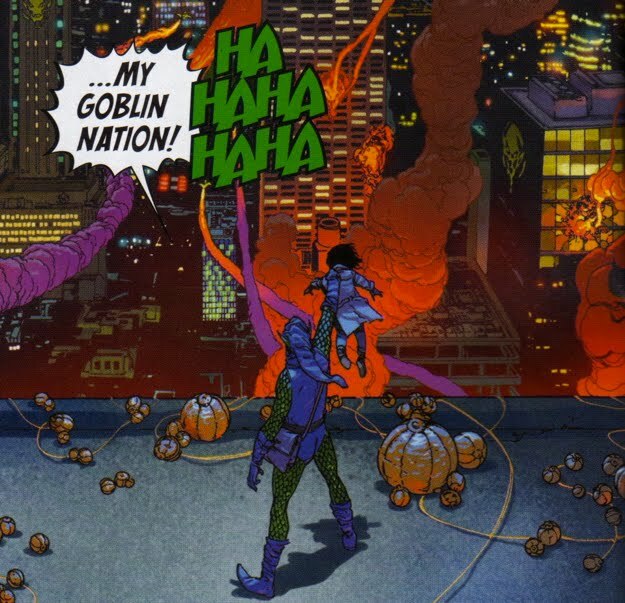 The Green Goblin, of course, is number 1. 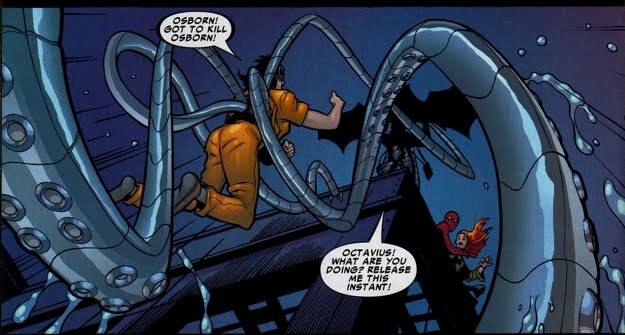 Despite both being heavy weights in the Spiderverse, Otto and Norman did not come in contact with each other very frequently. But when they did interact, things got ugly. 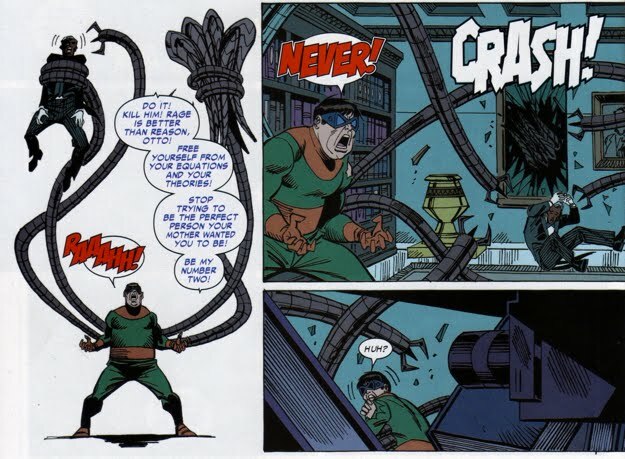 This web page is dedicated to describing the history between Norman Osborn (the original Green Goblin) and Otto Octavius (the original Dr. Octopus). 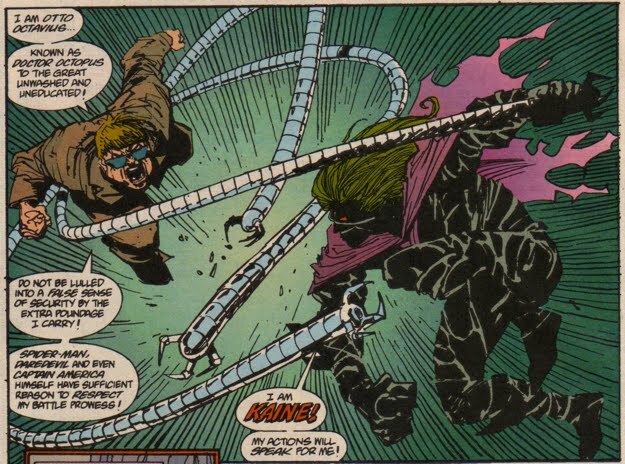 Let's quickly cover some of the similarities between Doctor Octopus and the Green Goblin. 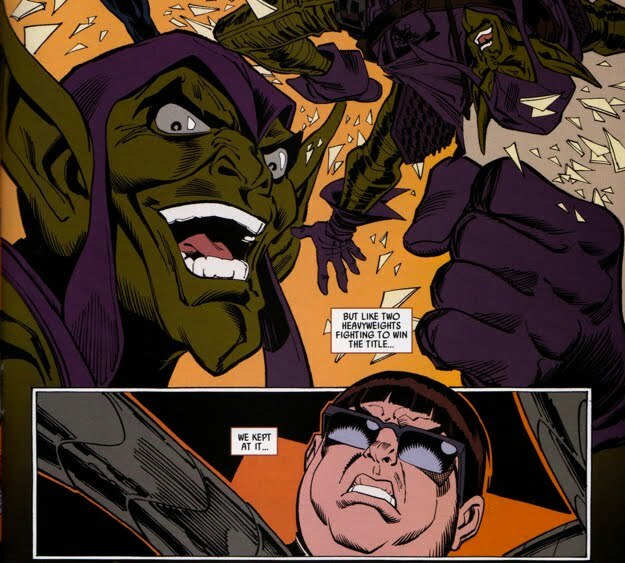 Both Doc Ock and the Green Goblin debuted in the Spiderverse at roughly the same time, Otto debuted in Amazing Spider-Man #3. 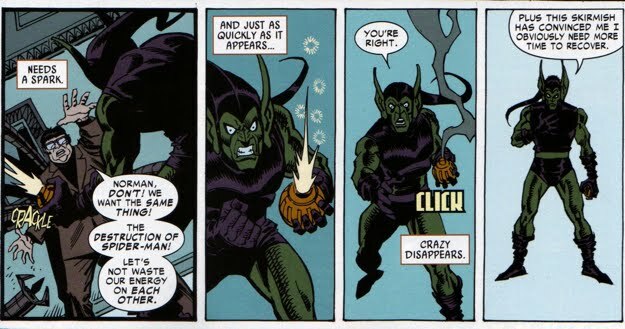 The Green Goblin debuted in Amazing Spider-Man #14. So they've both been battling Spidey for a long time. 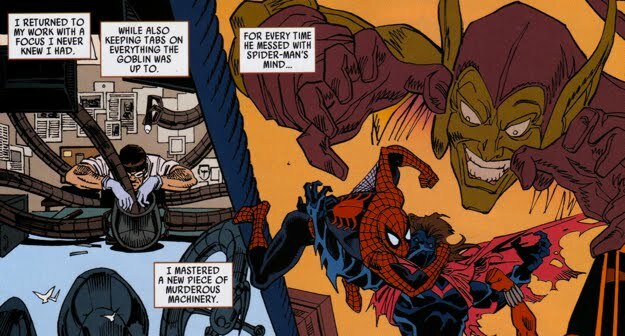 Both Otto and the Goblin unmasked Spider-Man relatively early in his heroic career, Otto did it in Amazing Spider-Man #12. 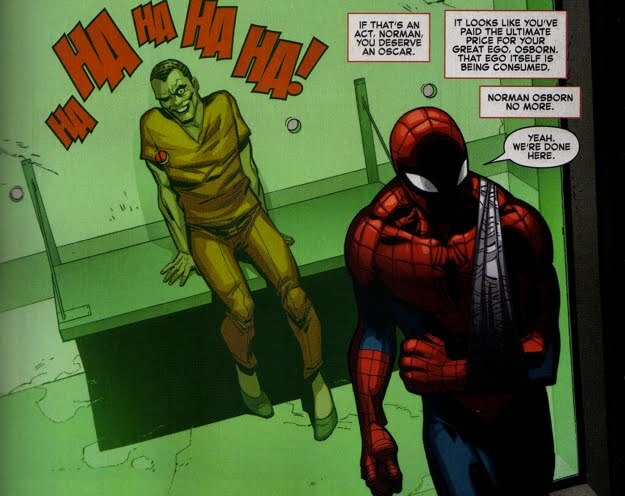 Of course he was fooled by Peter's inability to put up a good fight and assumed that he unmasked an imposter. 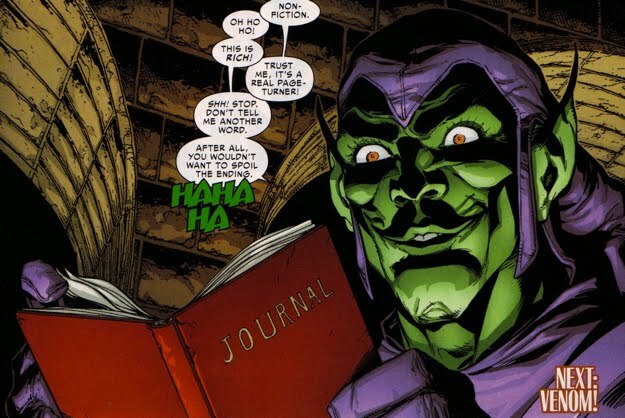 The Green Goblin was a little more slick about his unmasking. 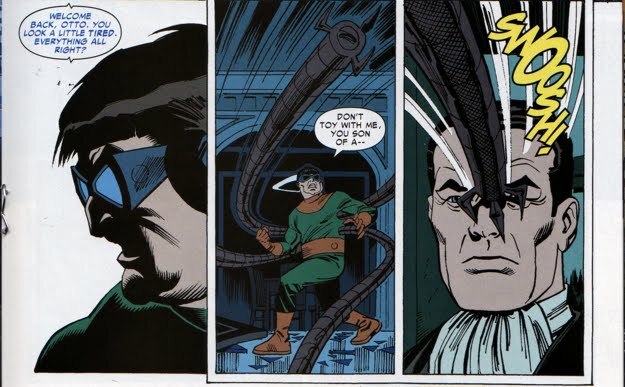 He nullified Peter's Spider-sense and then tracked him back to his home in Amazing Spider-Man #39. 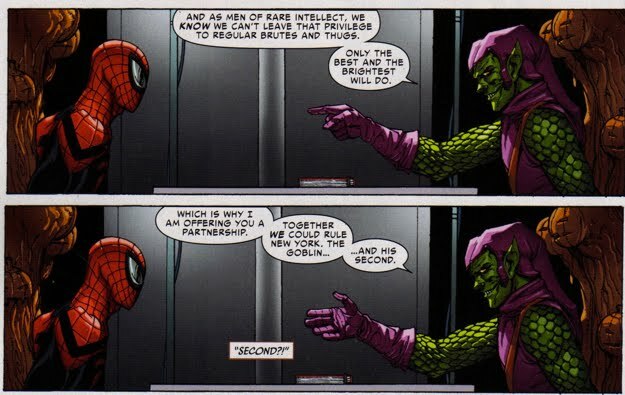 There was no doubt the Goblin had found the one true Spider-Man! 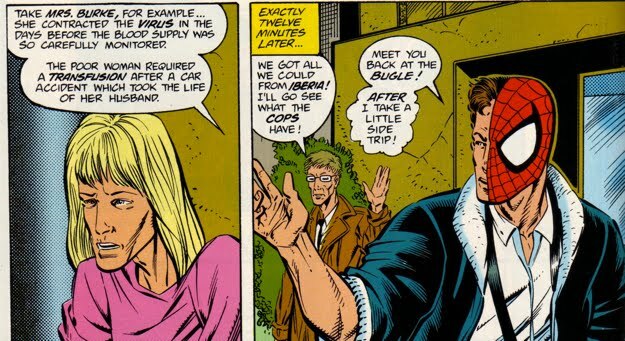 Both Otto and Norman have connections to Peter's Aunt May, Otto tried to marry her in order to extort an island she had inherited (seen in Amazing Spider-Man #131). That was pretty mild compared to Norman. 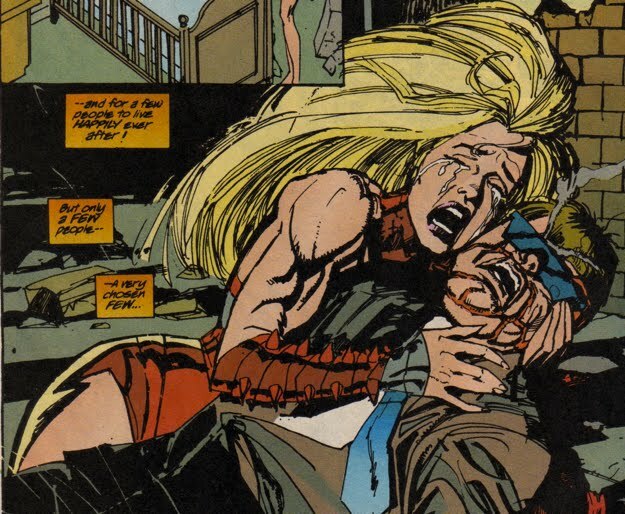 Norman kidnapped her, replaced her with a genetically altered actress, and staged her death in order to torment Peter. 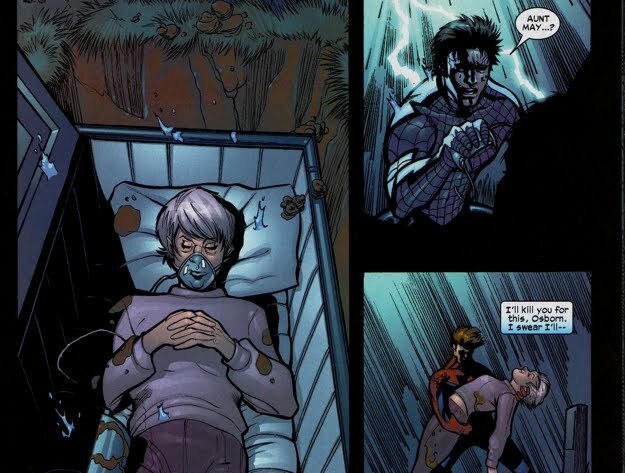 Once Peter caught on to it and tracked down the real Aunt May, Norman slapped her around and implanted a trigger device for a genetic bomb inside of her head. That was featured in the Final Chapter. 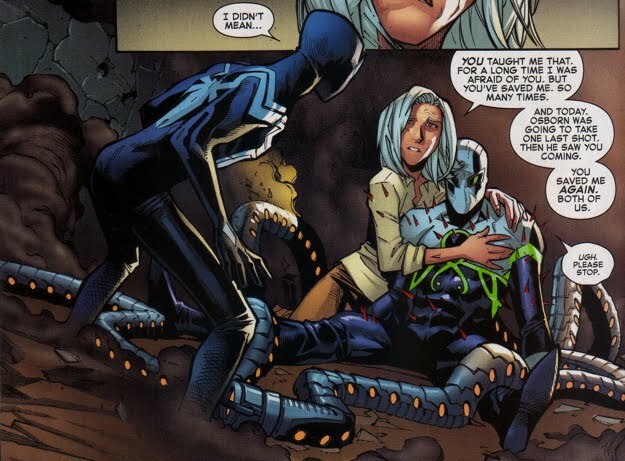 He kidnapped May a second time as well so that Peter would help him escape from a high security prison. 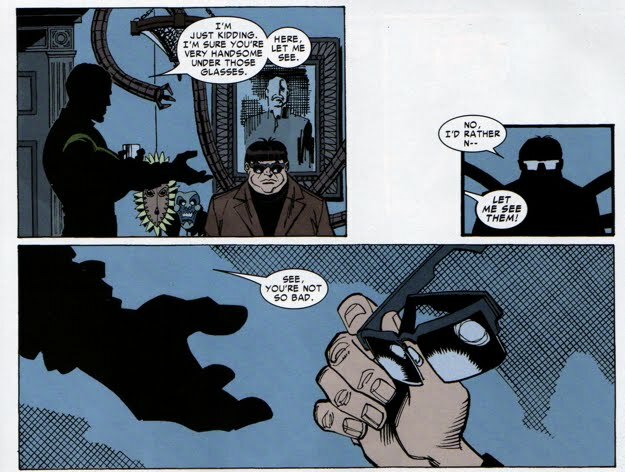 This was featured in Marvel Knights Spider-Man #12. 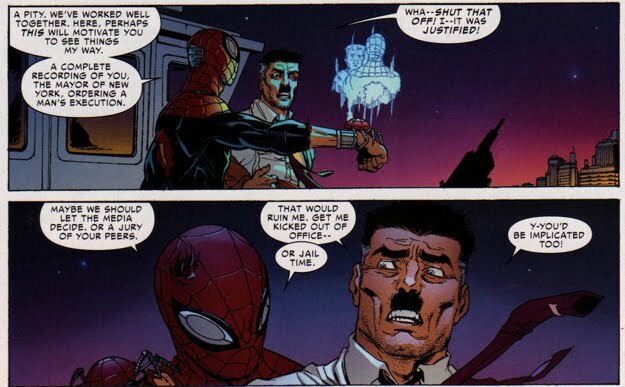 Aside from tormenting Aunt May, both men did the same to J. Jonah Jameson. 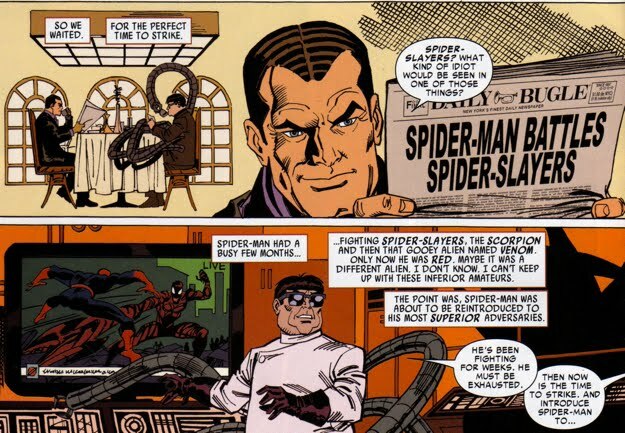 Norman blackmailed Jonah by threatening Jonah's wife Marla, which allowed Osborn to seize control of the Daily Bugle and begin his PR campaign to restore his 'soiled' name (panel below is from Spectacular Spider-Man #256). 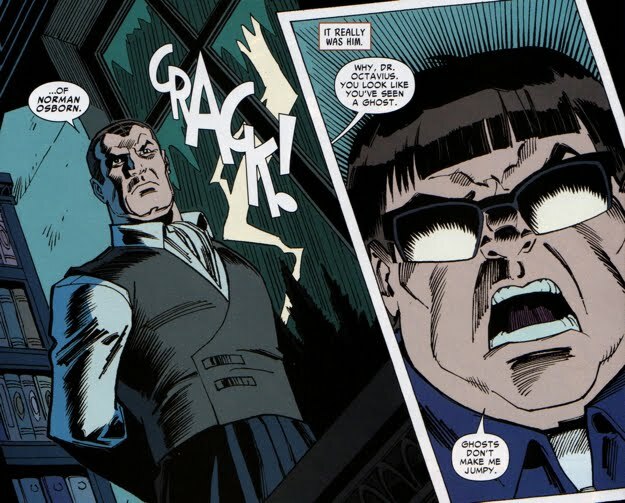 Otto blackmailed Jonah by recording the mayor as he ordered the execution of the man who killed Marla, Alistair Smythe. 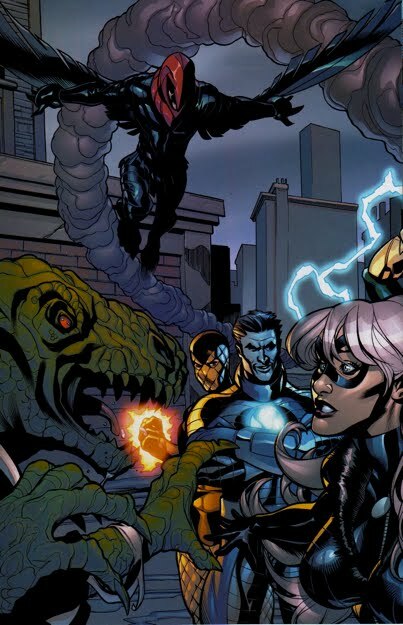 The panel below is from Superior Spider-Man #13. 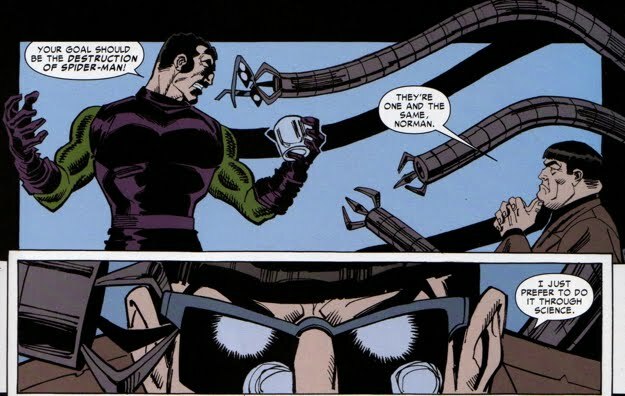 Of course Doctor Octopus founded the original Sinister Six in the Amazing Spider-Man Annual #1. 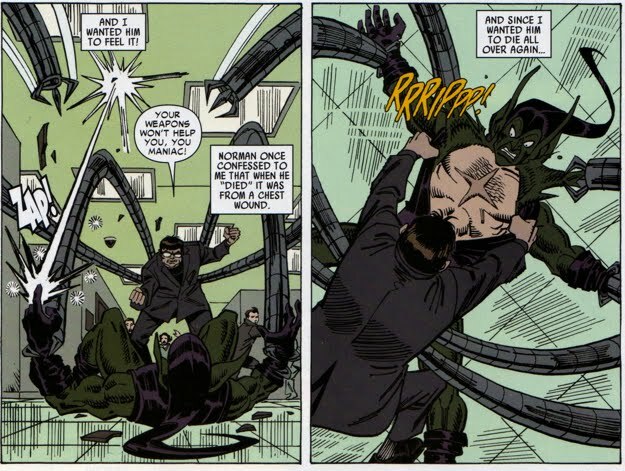 Both Octavius and Osborn 'died' and were resurrected. 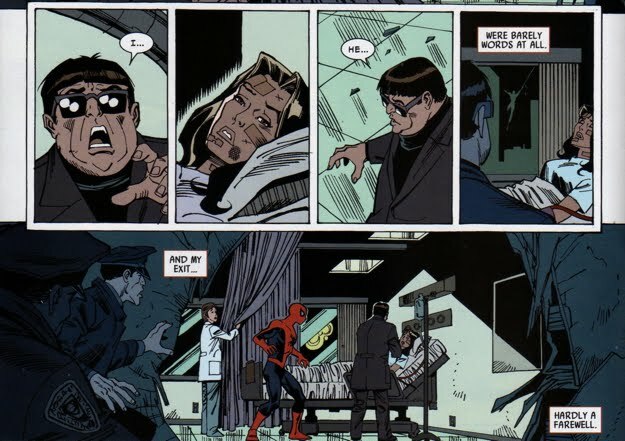 Octavius died at the hands of Peter's degenerate clone Kaine in Spectacular Spider-Man #221. 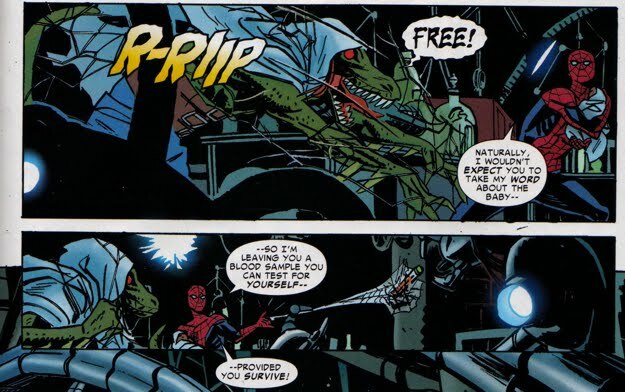 Thanks to his sweetheart Stunner, Otto was resurrected in Amazing Spider-Man #427. Unfortunately Otto had no recollection of Spider-Man's alter ego when he returned to the living world. 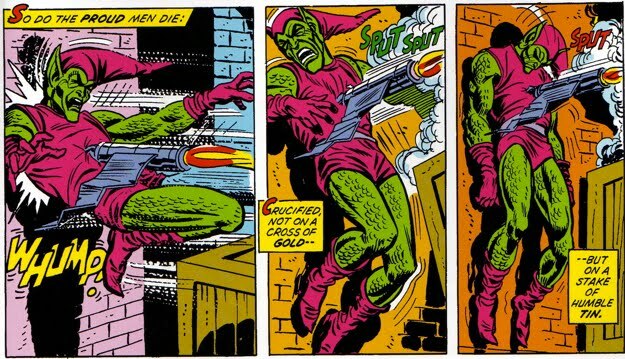 Osborn died via his own Goblin Glider in the classic Amazing Spider-Man #122. 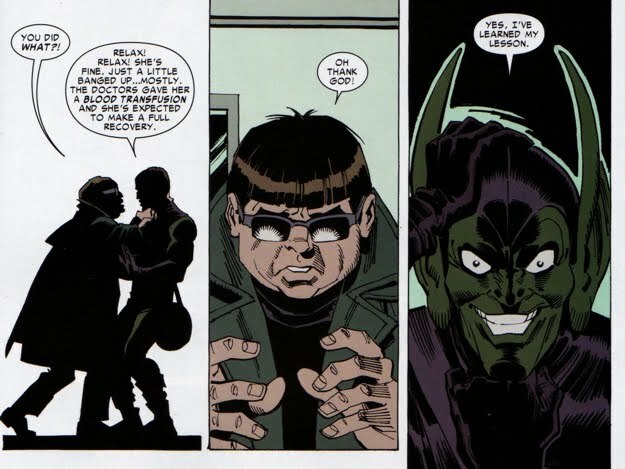 Unlike Otto, Osborn returned with full memory of Spider-Man's identity...and a massive chest scar. Okay, we've established that Norman and Otto have similarities and they have some differences...so where did their competitive feud begin? 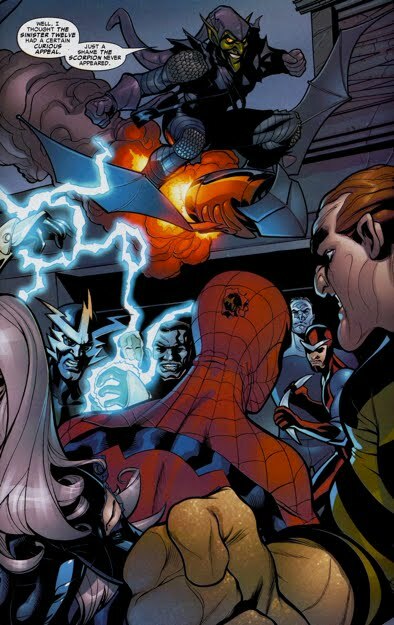 How about Amazing Spider-Man #18. 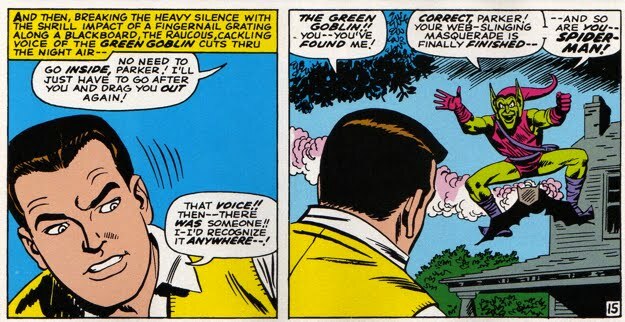 As the Green Goblin unjustifiably celebrated a victory over Spider-Man, Otto lamented the fact that he was not the one to defeat the web-slinger. This is really birth of their race to be the first to destroy Spidey. Time passed before Otto and Norman would come in contact with each other again; Norman would eventually 'die' and then escape to Europe to operate in hiding. Whilst in Europe, he built an immense information network in order to keep tabs on Peter. 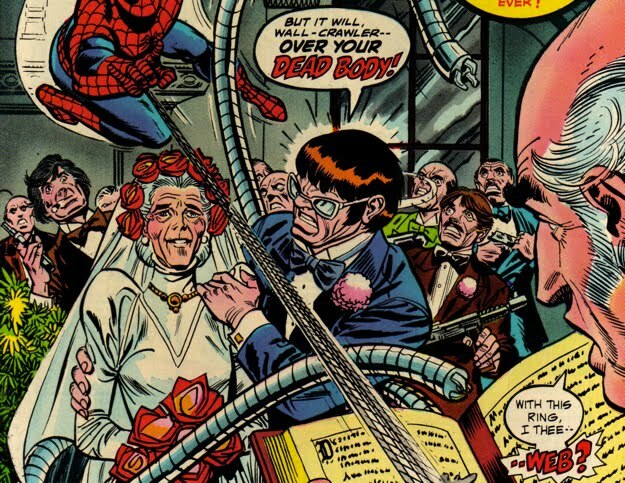 He undoubtedly observed Otto's attempt to marry Aunt May; Norman may have been inspired by that and thus raised the bar by faking May's death. 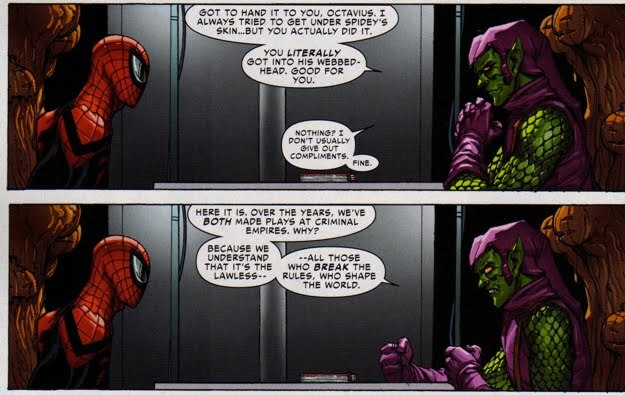 Around the time of Amazing Spider-Man #370, Osborn invited Octavius to join him in Europe (as seen in Superior Spider-Man Team Up #11-12). A complete summary of this event can found here. 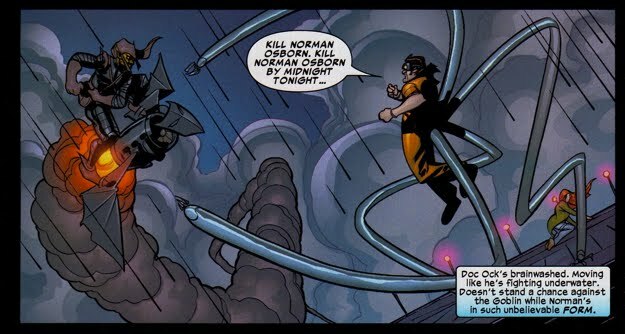 Norman invited Otto to Europe so that the two could work together to destroy Spider-Man. 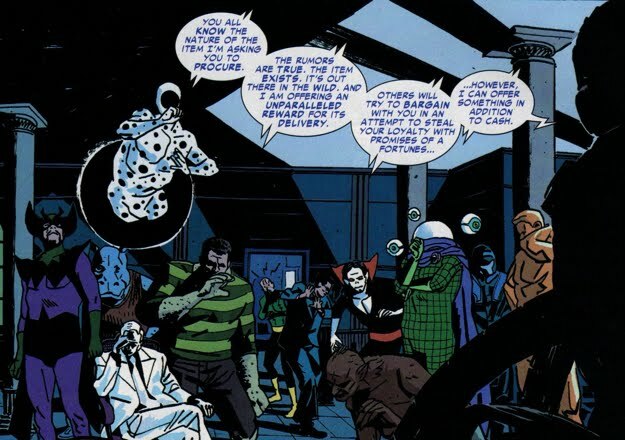 He insulted the Sinister Six in the process. A tremendous working relationship ensued as the two Spider-foes combined forces to defeat Spidey. They even bonded emotionally as Osborn shared details about his deceased wife Emily; which prompted Otto share details of his ex-fiancee Mary Alice Anders. 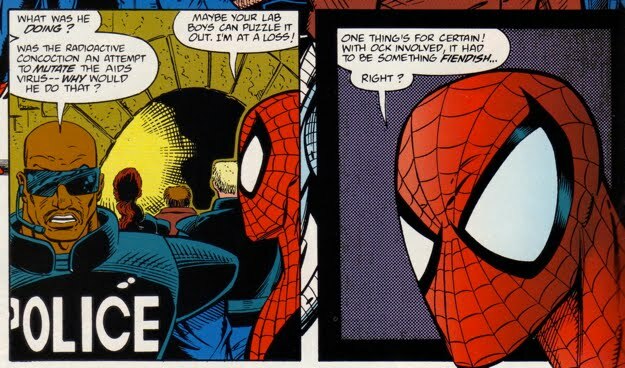 They bickered over the best method for defeat Spider-Man. They even created the Octo-Goblin together! And that's where the good times ended. Norman found Mary Alice, ran her car off the road, then infected her with the AIDS virus. 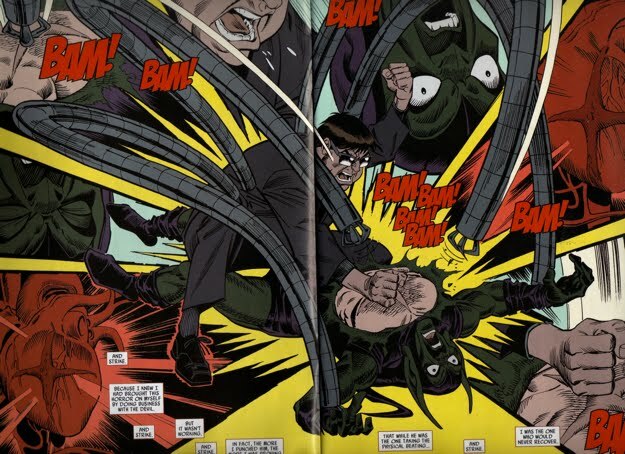 A rage-filled Otto Octavius tried to kill the Green Goblin for what he did to Mary Alice. 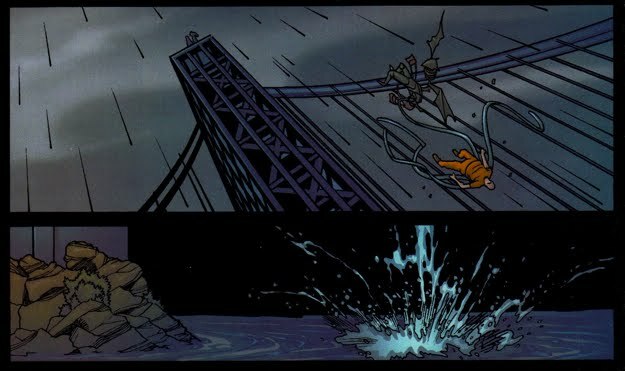 In the end, Otto was unable to save her life, as seen in Spider-Man Unlimited (V1) #3. Norman cowardly avoided Otto's attack so Otto declared war on Norman's ego. 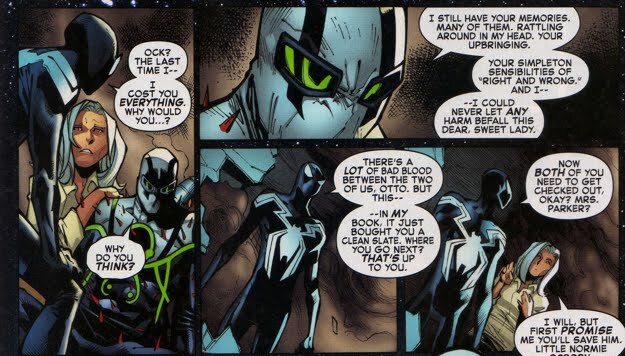 Their race to destroy Spider-Man officially began in a flashback/retcon scene from Superior Spider-Man #12. 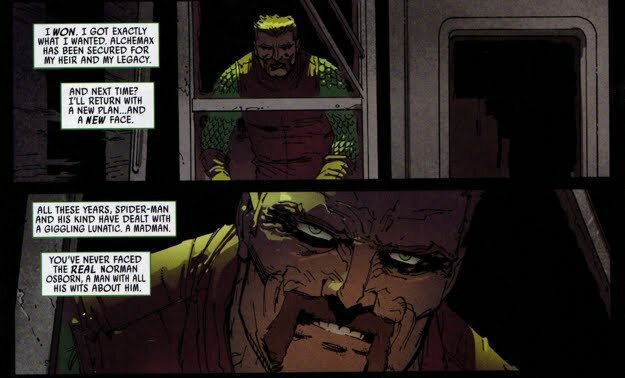 Interestingly once Norman emerged from the shadows and returned to the U.S. during his original Dark Reign, Peter compared him to Otto. 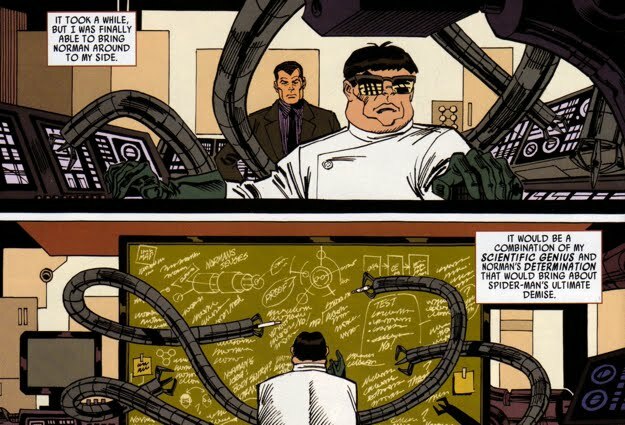 In Amazing Spider-Man #426, Peter considered the possibility that Doctor Octopus may still be alive because of the precedent that Osborn had set. 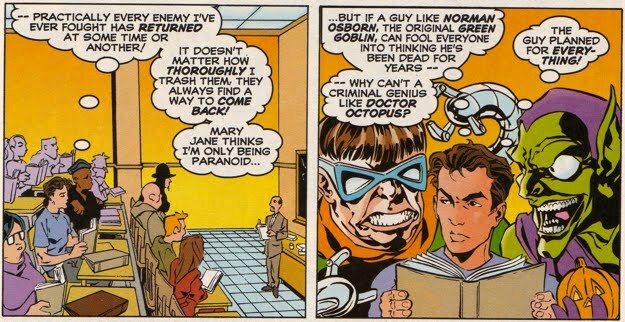 Otto enviously watched from the sideline as his rival Osborn stole the show publicly humiliating Spider-Man, as seen in Amazing Spider-Man #429. 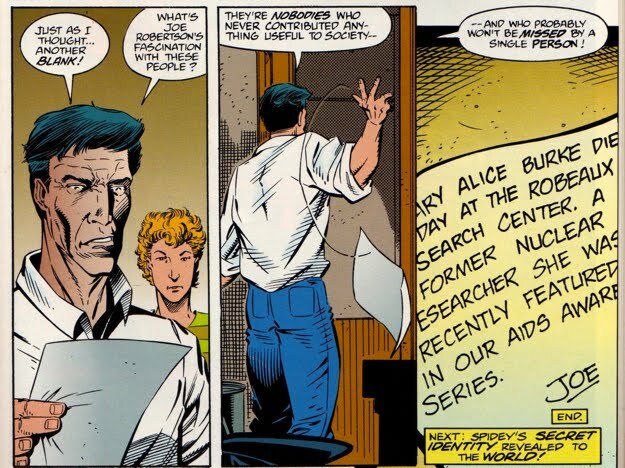 Even Carolyn Trainer can't stand Osborn, guess Otto must have explained his hatred to her. 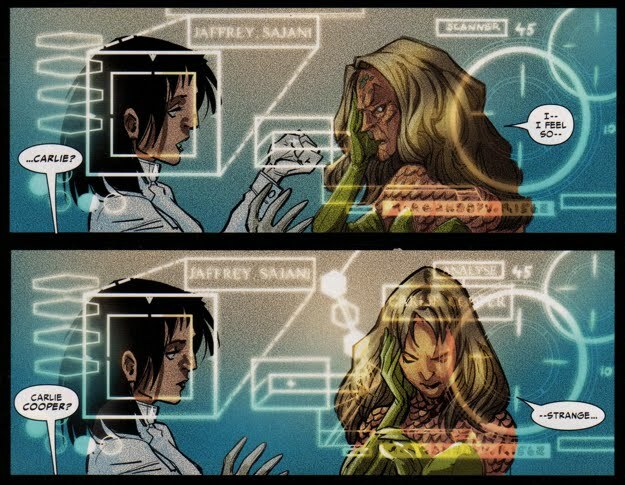 The Norman/Otto dynamic took a weird detour in the Defenders (V2) #10. 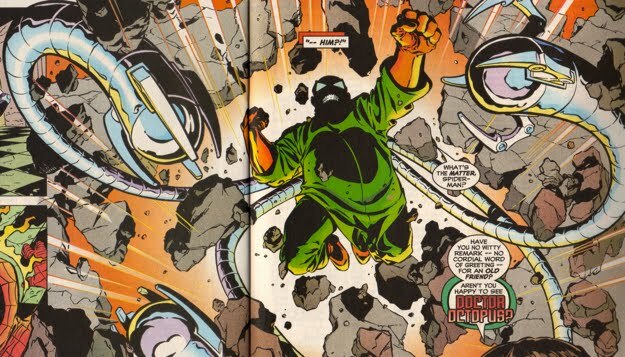 Without delving too deep into this quirky tale, during a battle that involved M.O.D.O.K., the headmen, the Defenders and an alien called Orrgo the Green Goblin and Doctor Octopus (along with a slew of other villains from the Marvel Universe) were summoned to attack the heroes. 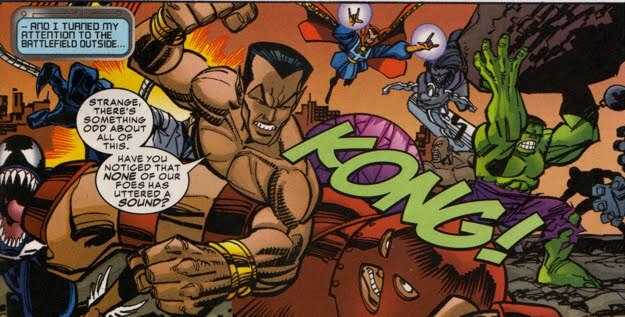 As Prince Namor and Nighthawk note in the following two panels, the collective group of villains did not make a sound and were basically brain-dead. 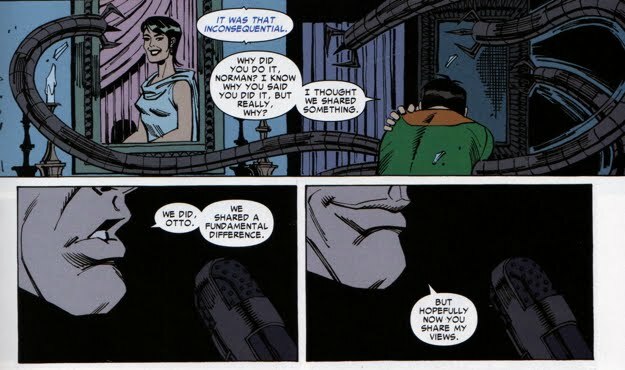 So this cooperative attack involving Otto and Norman technically has an asterisk next to it because they were not of sound mind (as sound as Otto and Norman can be). 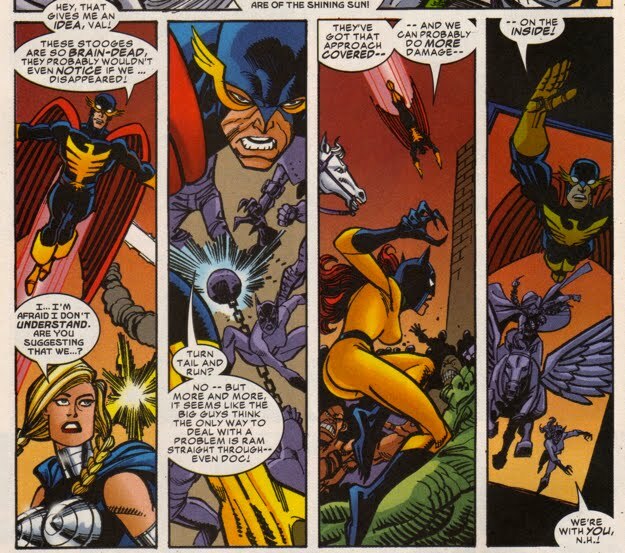 They were eventually defeated once the Defenders regained control of Orrgo. 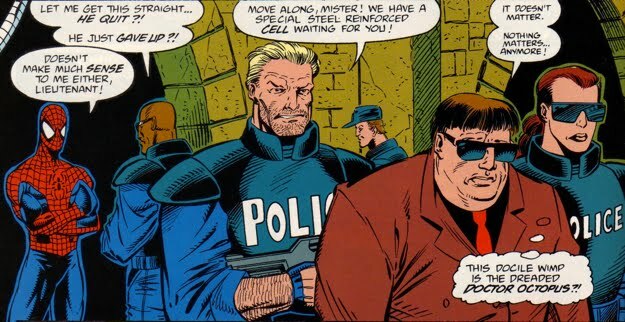 Once Osborn was publicly outed as the Green Goblin, he soon found himself locked up in high security prison. 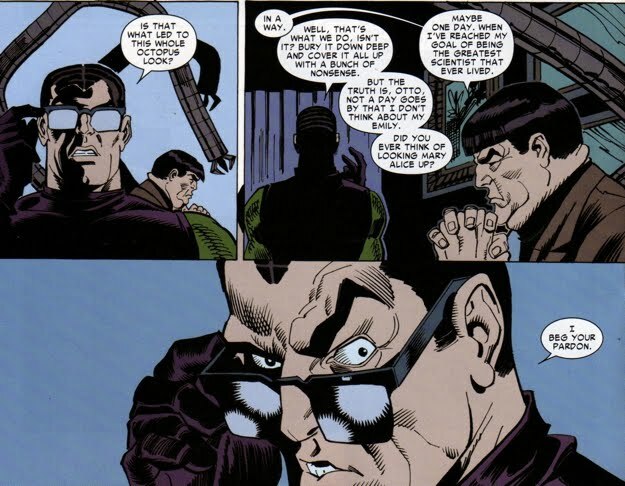 Unfortunately for Osborn, due to his affiliation with a treacherous 'cabal' he quickly became the target of a manhunt. 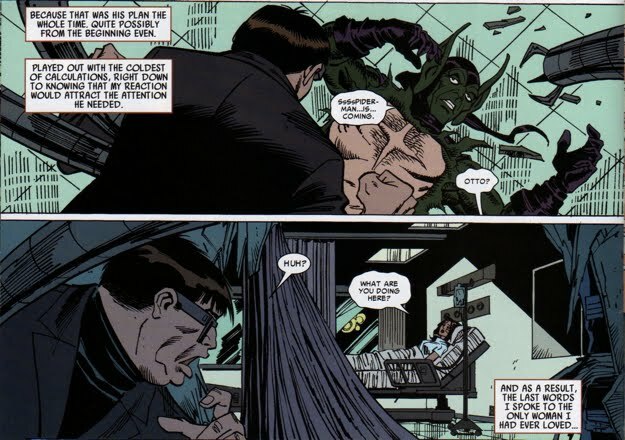 Osborn needed to escape the confines of the prison in order to survive so he tricked Spider-Man into helping him escape. 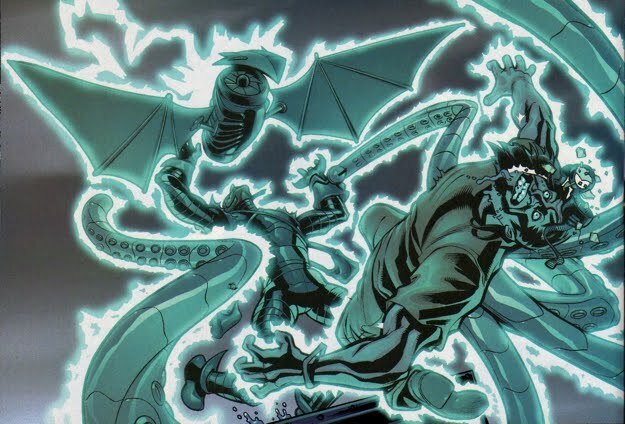 The cabal had tricks up their sleeve though and their secret weapon was none other than a mind-controlled Doc Ock! 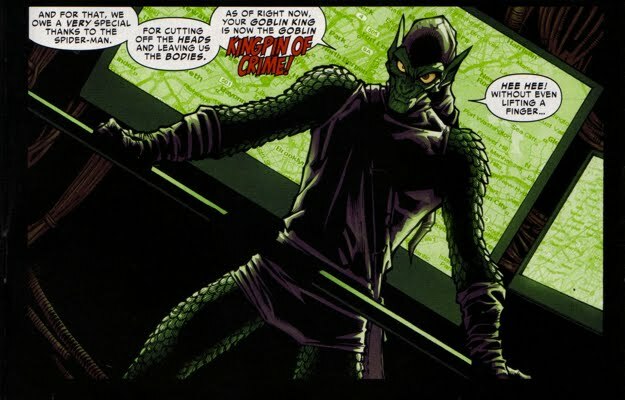 The name 'Osborn' soon became a trigger word for Otto, causing him to prematurely exercise his protocol to destroy Norman Osborn! 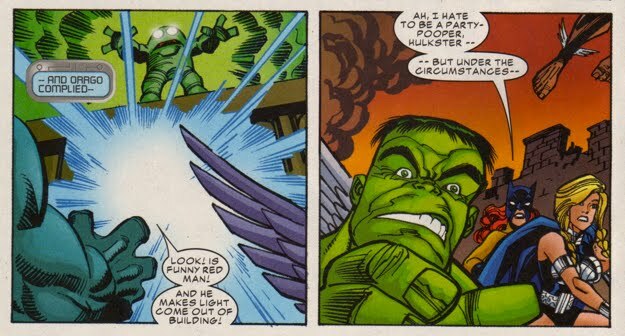 But Otto got his second wind and this time he took down the Green Goblin with him...a lightening bolt didn't help matters either. 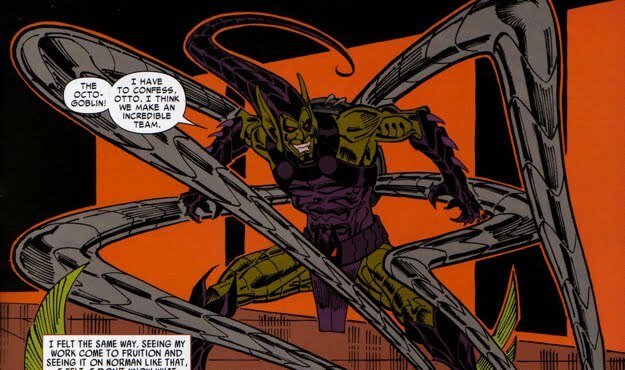 Otto remained fairly obsessed with the Green Goblin, he even went as far as recruiting an army of villains to track down Norman's supposed son during the Origin of the Species storyline which began in Amazing Spider-Man #642. 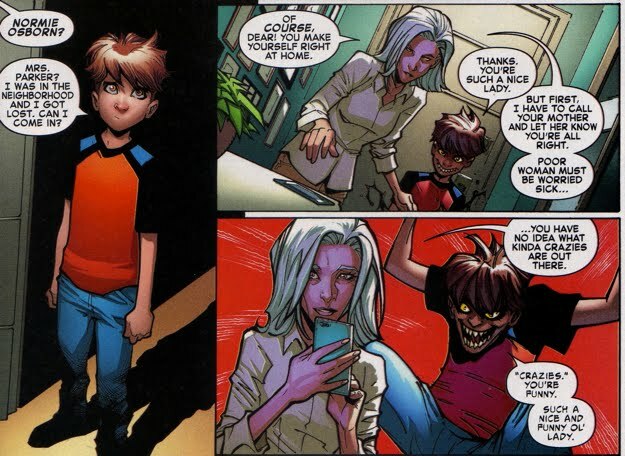 Otto's premise was that the child of Lily and Norman (who were both exposed to the Goblin Formula) would be a biological singularity...not to mention a good bargaining chip against Norman. Otto even delivered the child! Otto's plan failed miserably in a number of ways. First, the child ending up belonging to Harry not Norman. Secondly, there was nothing special (genetically) about the child; no biological singularity, nothing...just a regular kid. Thus ended that campaign. 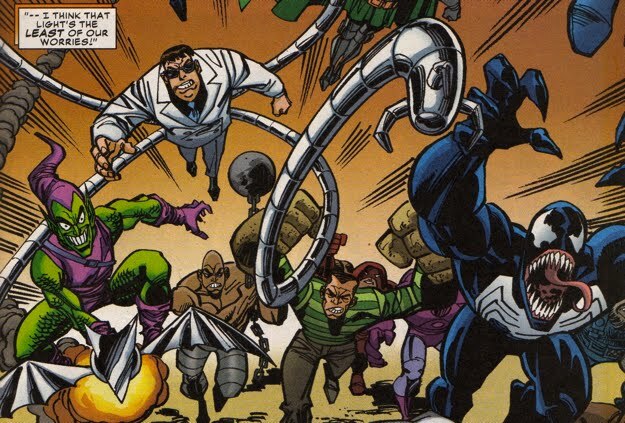 Later, Otto Octavius would take home a tremendous victory against Spider-Man. 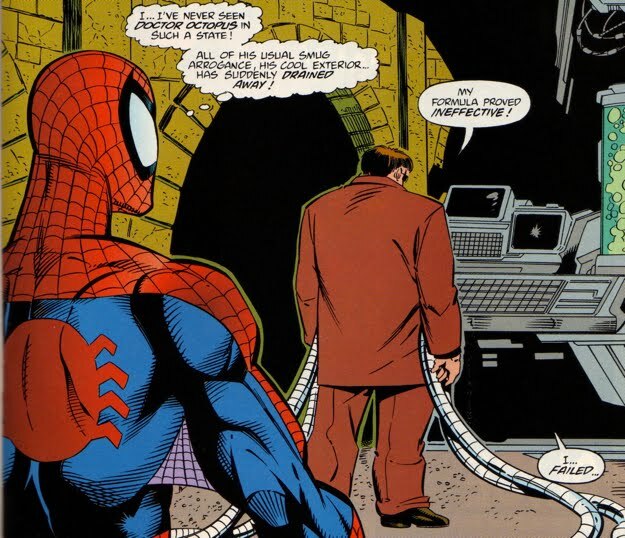 He managed to execute a mind-swap that left Peter Parker's mind inside the rotting near-corpse of Doc Ock. 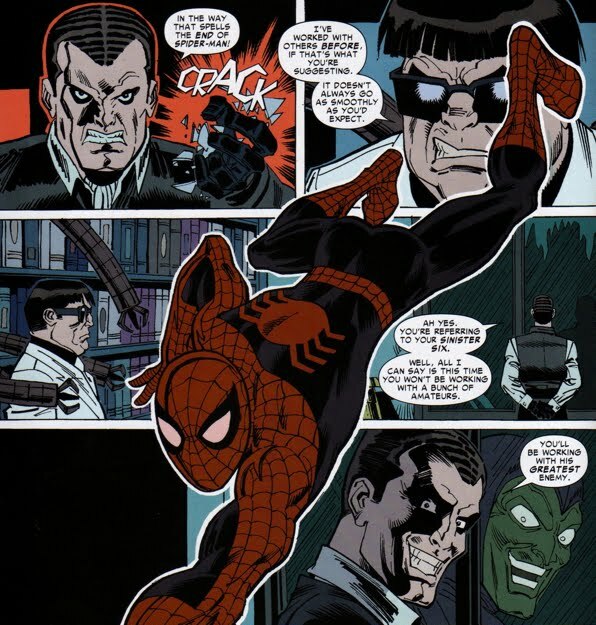 This left Otto free to take on the life of Peter Parker and become the Superior Spider-Man. 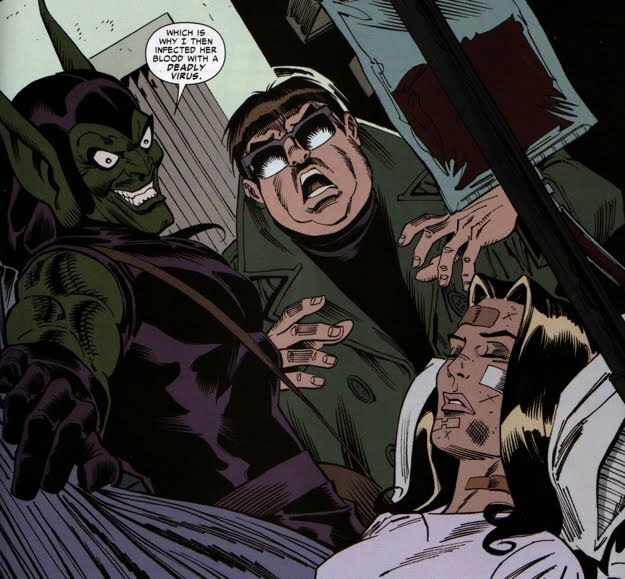 Otto's ruthless style of crime-fighting unintentionally led to ascension of the Green Goblin as the new Kingpin of Crime. 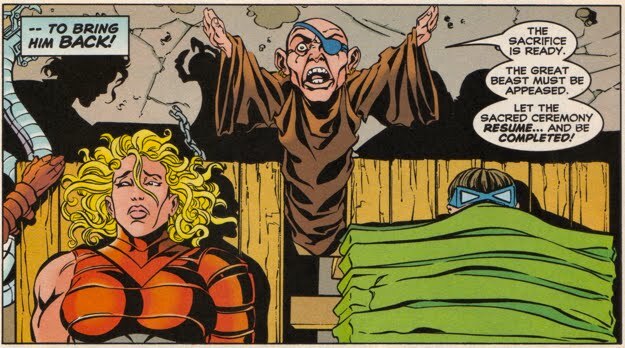 Norman referred to himself as the Goblin King and he launched an attack against Otto which culminated in the formation of his Goblin Nation. 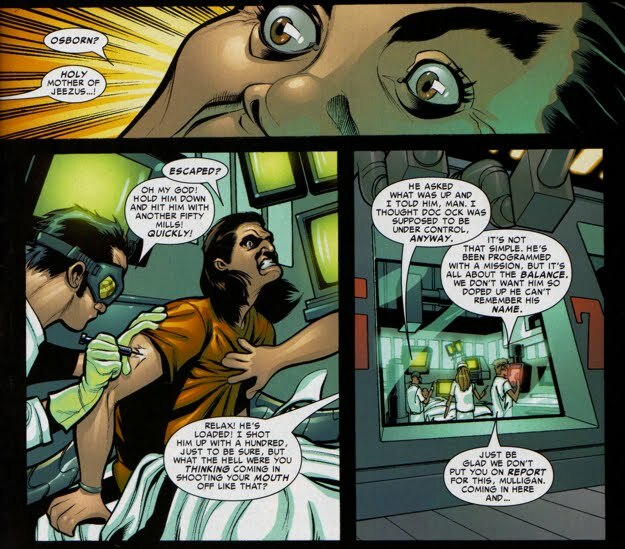 After kidnapping Carlie Cooper and reading her journal, Osborn uncovered Otto's secret in Superior Spider-Man #21. 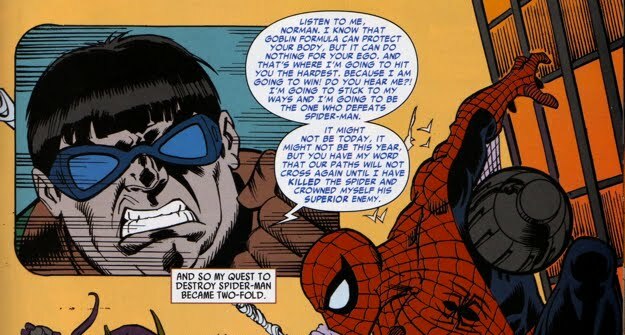 Interestingly, since this was a post-Brand New Day story Norman did not know Peter Parker was Spider-Man...so he struggled to see who's body Otto actually took over. 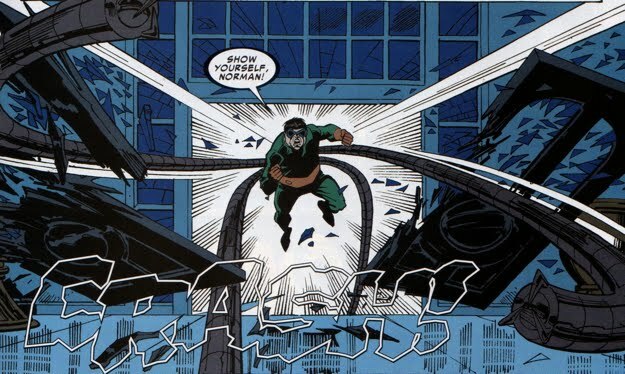 In fact, Norman thought Peter Parker was Spider-Man's best friend. 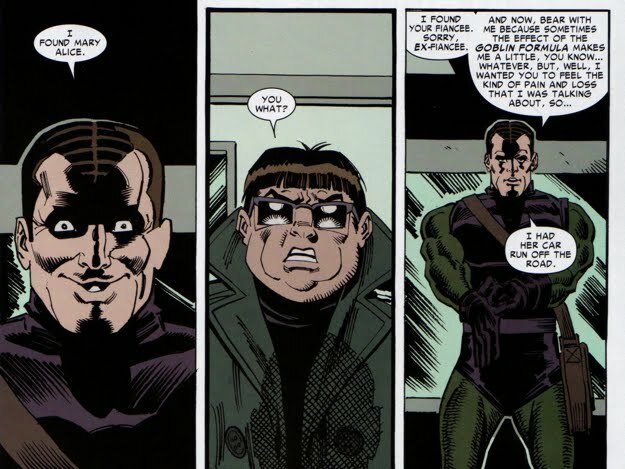 Nevertheless he confronted Octavius and even passed a few compliments his way for what he did to Spider-Man. He then proposed that they work together and Otto become his #2, his right-hand man...Otto declined the offer. Instead, Otto did what Otto does best...science. He, along with Sajani Jaffrey, developed a 'cure' for the Goblin Formula. This was used to reverse the effects of the Goblinized-Monster, Carlie Cooper. As Osborn's Goblin Nation went in to full -wreak-havoc mode, the grand finale of his assault involved kidnapping and nearly killing Otto's girlfriend, Anna Maria Marconi. 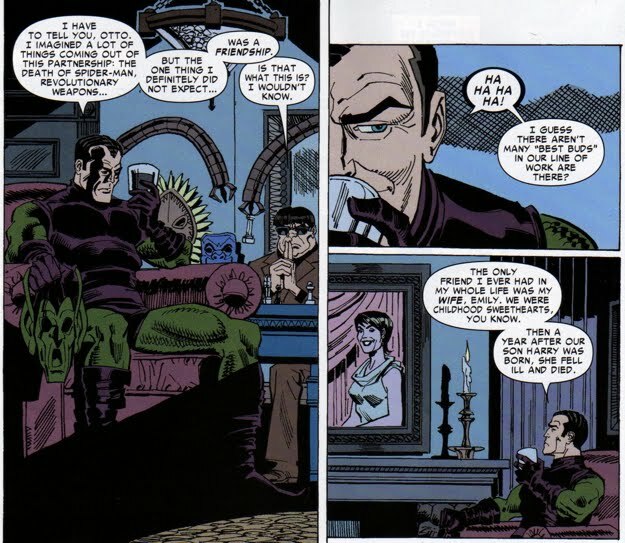 Osborn obviously had a thing for tormenting the women on Otto's life. 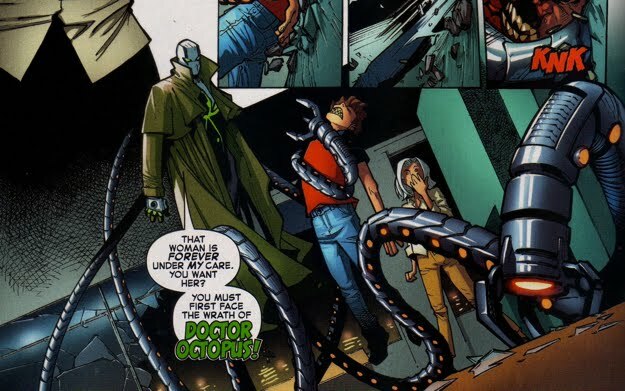 Peter Parker would eventually return to his body (as Otto erased himself) and he would save Anna from Osborn. 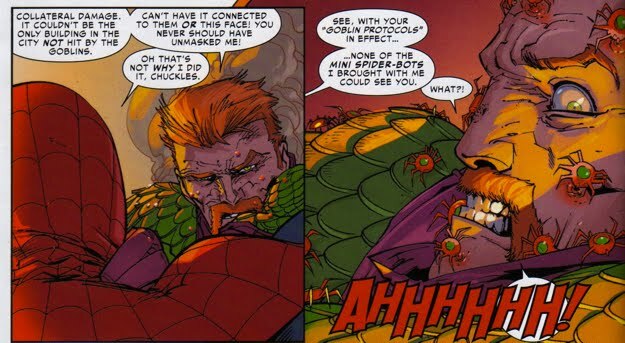 When Norman Osborn hybridized his Goblin persona with the Carnage symbiote, he became the Red Goblin. 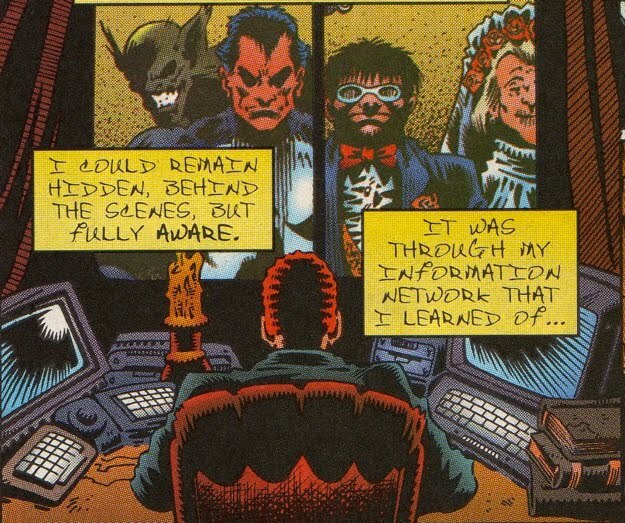 One of the first things he did was convert his own grandchild, Normie Osborn, into a Carnage-bound symbiote as well. 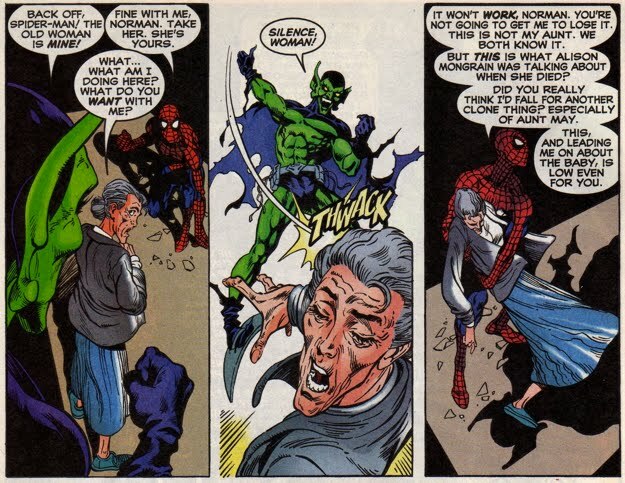 He then sent Normie to go kill Aunt May, as a means of getting back Peter. 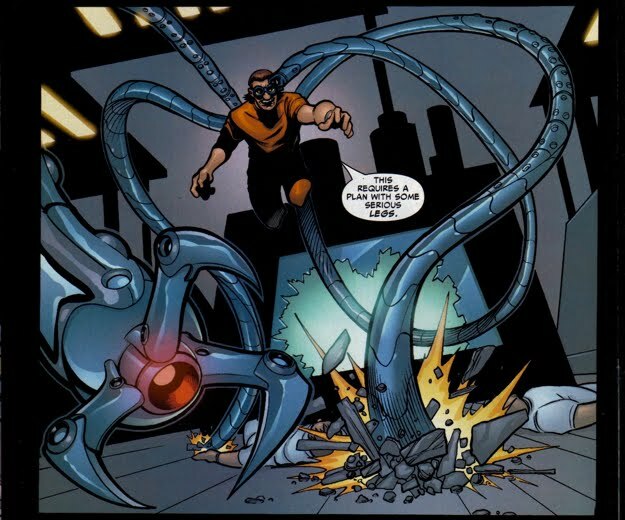 But Grandpa would eventually show up and with a few punches and swipes he's able to neutralize Doc Ock. 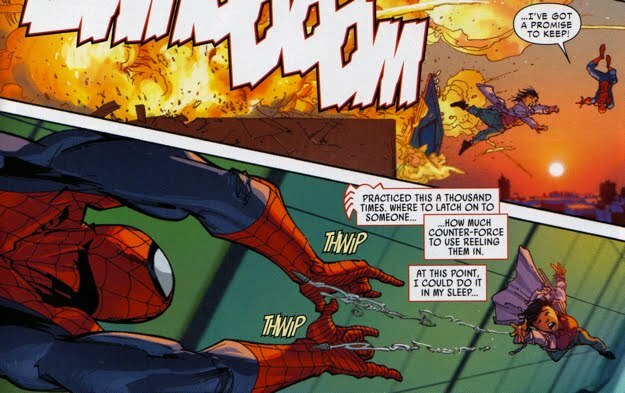 With Otto incapacitated, Norman set his sights on Aunt May and he blasts Carnage-shrapnel at her. 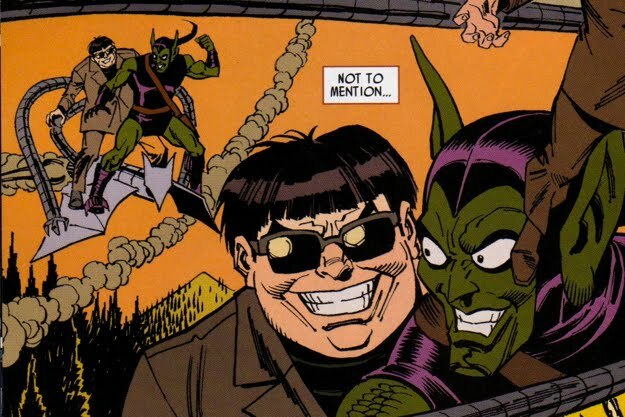 Once again, however, Otto jumped in front of the Goblin offensive, saving Aunt May in the process. 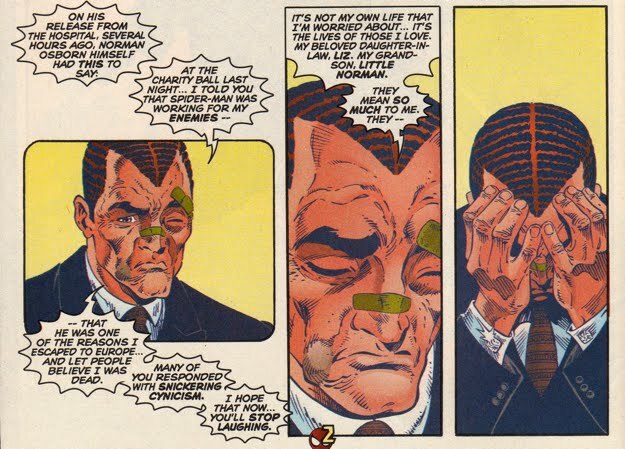 Otto explains that his altruistic act was due to Peter's memories that are still inside his brain, giving him hero-like sensibilities. Peter and Otto bury the hatchet after their discussion. 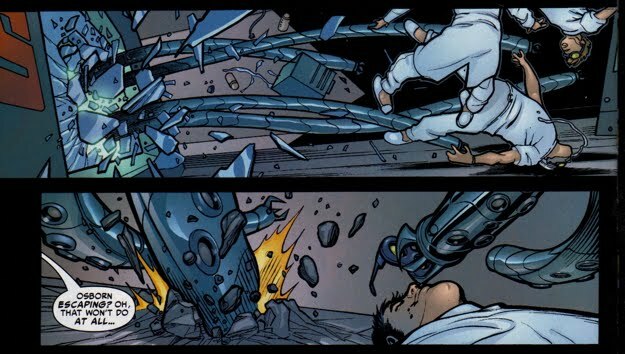 Flash Thompson would later return to remove the Carnage-shrapnel from Otto and spare his life. And that is where their rivalry stands, they'll certainly cross paths again...and when they do, it'll be on this page!